As a dog lifestyle website, the questions we get from you, our readers, most frequently start with ‘can dogs eat…?’ with anything and everything going in the blank space! So for today’s article, we’ve been asked, so we shall answer: can dogs eat cheese? 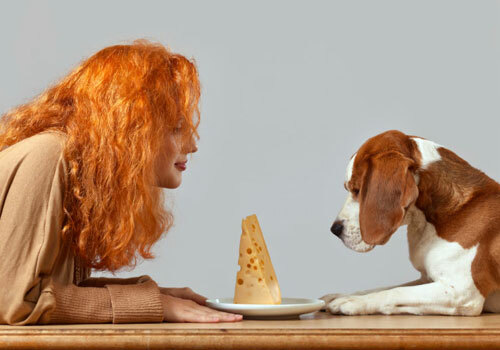 The majority of human food sits in between on that scale and cheese is no exception – it’s only good when given in moderation and with consideration of your dog’s digestion. Some dogs react really well to cheese, and that’s great! It means there’s another healthy snack easily on hand for you to feed your dog. However, other dogs may be lactose intolerant and cheese and dairy in general may give them stomach upsets. That’s why all responsible dog owners always need to research potential dog snacks before feeding them to their pooch. 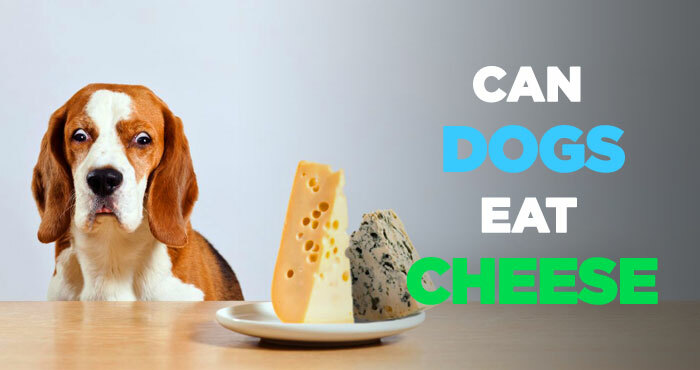 In this article, we’ll take a detailed look at our favorite food – cheese – and its effects on dogs. When fed in moderation and with consideration of your dog’s potentially undiscovered allergies, cheese can be very healthy for dogs. Man’s number one favorite dairy product is absolutely jam-packed with vitamins and minerals such as calcium, Vitamin A, and essential fatty acids. All these ingredients ensure that your pooch will have a healthy digestion, great bone structure, and a shiny, soft coat. It’s particularly healthy to buy cottage cheese for dogs, as it is higher in protein than other cheeses. Cottage cheese is especially good for dogs that often have loose stool. The high levels of protein in this tasty cheese will make sure to put your pooch’s digestion back in order. Another particularly great use of cottage cheese is feeding it to dogs who are recovering from an illness or injury. An increased intake of protein will make the healing process a lot faster and is sure to get Fido back on his feet soon. Buying cheese for dogs also means securing them with a lot of healthy fats, which cheese is full of. This is particularly useful for pooches that need to bump their weight up a bit. Again, make sure not to feed them too much because fat can be a double-edged sword, as we’ll explain later. However, the increased amount of it in cheese can speed up your dog’s recovery on the way to a healthy weight. Not just that, but cheese also has a very strong and distinctive smell and taste, especially for dogs. Using it as an addition to the food bowl can help in bringing back the appetite of dogs that might have lost it for whatever reason. Just adding small pieces of cheese should be enough – the dog will smell and taste it, and their taste receptors will be triggered to want more. Cheese makes it easy for dog owners to portion their pup’s treats as well. It comes in blocks that can easily be cut up to the amount of weight that you want. And just like that, cheese can be a very favorable addition to your dog’s regular diet. So, the answer to the question: can dogs eat cheese, is absolutely YES. Now, let’s see how is cheese bad for dogs. Why Is Cheese Bad for Dogs to Eat? Dogs and cheese aren’t always a favorable combination. In fact, there are many pooches out here that won’t enjoy cheese at all because they’ll be allergic to it. 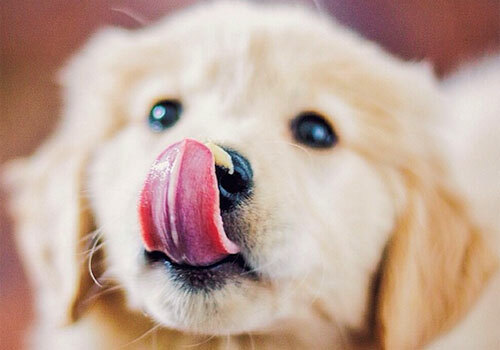 Just like humans, dogs can also be lactose intolerant. The reason why this happens – both in dogs, cats, humans, and any other lactose intolerant species – is because the body doesn’t have any lactase, an important enzyme, responsible for digesting lactose, a sugar found in all cheese and dairy products. Unfortunately, there is no test for lactose intolerance in dogs. It’s very much a trial and error situation, so to avoid unpleasant surprises it’s always good to start off your dog on very small quantities of cheese. Not all dogs are lactose intolerant to the same degree. Your dog might be very mildly intolerant and still be able to eat cheese, or they can be severely intolerant, and just the smallest whiff of the stuff sends them to the vet. There is no way of knowing beforehand. There are also varieties of cheese that your dog should never eat because they contain elements of other things that are toxic foods to dogs. Cheese with any kind of grapes, raisins, garlic or onion in it is an absolute no. Your dog will have a very unpleasant reaction to these and might end up in a life-threatening situation. Other kinds of cheese to avoid are the ones that are high in sodium. That’s because too much sodium or salty food, in general, can also be very toxic for dogs. Those cheeses include, but are not limited to, Swiss cheese (which is most often eaten with crackers and those are just absurdly bad for your dog), all grilled cheeses and cheeses on pizza (again, because they’re very salty), cheddar, blue cheese, parmesan cheese, feta cheese, etc. Mozzarella can be good, as long as it’s low-fat and low-sodium and not on top of a pizza. So to sum up, keep an eye out for your dogs eating cheese – eating too much or eating the wrong kind can be seriously bad for them. Keep the cheese intake regular, healthy and pleasant! How To Prepare Cheese For Dogs? If you’re planning to try out the dogs and cheese combo, make sure you follow these simple safety rules so that your pooch can enjoy cheese to the fullest. Cheese can be a very tasty addition to your dog’s regular food. It even features in some gourmet dog food recipes, adding both a lovely flavor and texture for your dog to enjoy. If you’re considering adding cheese to your dog’s regular food, always consult your vet beforehand for the best way to go about it. Remember, frequency is key. Too much cheese means your dog will develop a constant craving for the stuff, which isn’t good! 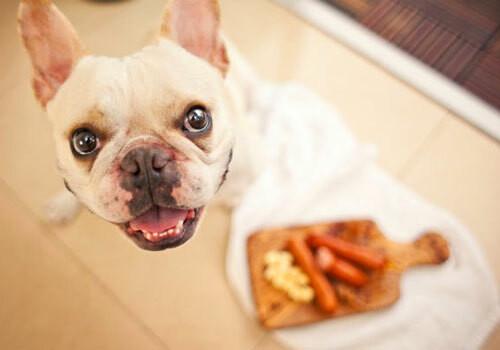 Use cheese as a small treat, if you think your dog benefits from treats training. Cheese can be a great ally when your dog is being difficult with his medication. Wrapping the medication in cheese to fool your dog into swallowing it is an old trick in the dog owner’s book. Make sure this is an absolute last resort and consult your vet beforehand to make sure the cheese won’t stop or delay the medication from being digested, as the fats in cheese tend to have that effect. Finally, always keep an eye on what kind of cheese your dog is eating. If you’re prone to having fancy, flavored cheese at home, always keep it out of reach. The best one is cottage cheese for dogs, i.e. low-sodium, low-fat cottage cheese or mozzarella. My Dog Ate Cheese in Large Quantity! What Should I Do? Like we said before, there’s no way of knowing whether your dog’s lactose intolerant or not, so the only way to find out about it is by giving them a normal amount of cheese and seeing how they react to it. 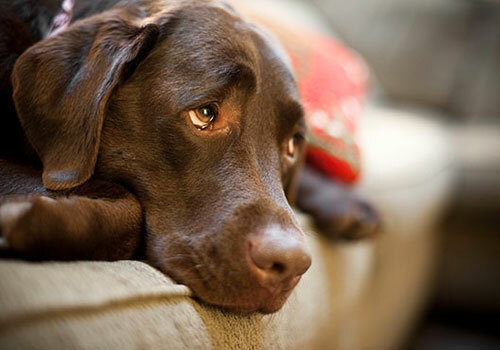 As a result, your dog might become constipated, develop loose stool and exhibit signs of flatulence and bloating. If you notice anything like this, stop giving your dog cheese immediately and talk to your vet, discussing potential lactose intolerance. Don’t stress too much though – giving dogs cheese is in no case life-endangering, even for lactose intolerant dogs. If your pooch happens to gorge on too much cheese, they might exhibit those symptoms as well, even if they’re not lactose intolerant. Don’t give them cheese for the next three weeks at least and after that resume giving it to them in very small qualities and as a special treat. If your dog accidentally eats cheese with added ingredients such as onion, garlic, grapes, or raisins, make sure to take them to the vet immediately. These products are extremely toxic to dogs and ingesting them even in the smallest quantity might be fatal. Dogs and cheese? Cheese and dogs? Cheesy dogs? If all the information so far has gone to your head a bit, here’s a handy dogs-and-cheese cheat sheet. It explains everything from why cheese is good or bad for your dog to how much cheese you should feed them. If you have any more cheese-related dog questions (or indeed, dog-related cheese questions) make sure to ask us in the comments below this article. 1. Can dogs have cheese? Is cheese ok for dogs? When fed in moderation, cheese can be a very healthy treat for your furry friend. It’s jam-packed of calcium and vitamins, which can be very helpful for your dog’s bones and coat. It’s also full of protein, which is one of the best nutrients your dog can receive from cheese. It’s also a very pleasant flavor and texture as an addition to any home-made dog food. 2. Can dogs eat cottage cheese? Is cottage cheese good for dogs? Out of all the types of cheese, cottage cheese is perhaps the healthiest one for your dog. It has a low level of sodium, which prevents toxicity, and a low level of fat, which counters any obesity problems. Besides, it has even more protein than regular cheese and dogs absolutely love it. If you’ve chosen to add cheese to your dog’s diet, cottage cheese for dogs should definitely be your first choice. 3. What kind of cheese can dogs eat? Choosing the right type of cheese is crucial to delivering the best cheese experience for your dog. Low-fat, low-sodium cheeses are the best for your dog. Cottage cheese and low-fat, low-sodium mozzarella are normally the best choices. Goat cheese is also a great choice for dogs, and it tastes great too! Also, the cheese should be raw rather than grilled or baked. 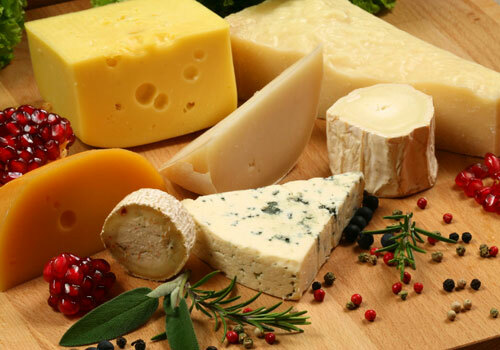 Avoid very salty cheeses (like Swiss, blue or feta) or cheeses that have onion, garlic, grapes or raisins in them. 4. Are dogs allergic to cheese? 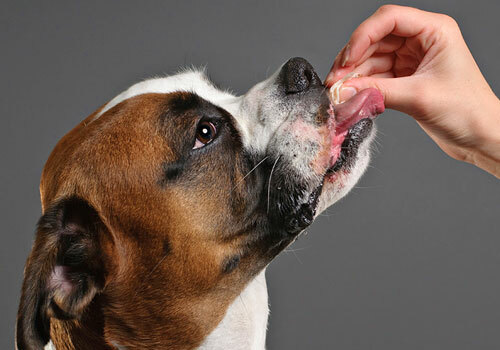 Some dogs are – always try feeding your dog a little bit of cheese first! Your dog might be lactose intolerant without you even knowing so don’t let them gorge the first time you feed them cheese. Common signs of allergy are bloating, flatulence and digestive problems, so if your dog exhibits any of these, stop the cheese and get them to a vet! 5. How much cheese can a dog eat without getting sick? And how often? As a rule of thumb, it’s always good to feed your dog small-to-moderate quantities of any human food (that’s not toxic to them). Often intake of cheese will get your dog addicted to it, which you don’t want. 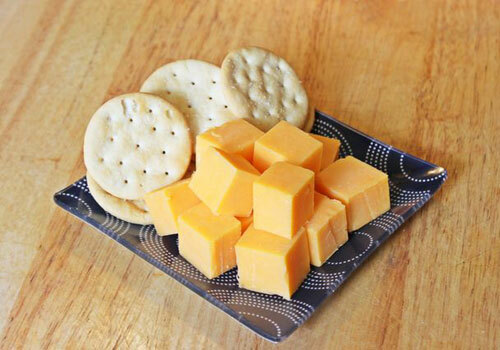 Use cheese as a special treat rather than a daily meal addition. 6. Can puppies eat cheese? 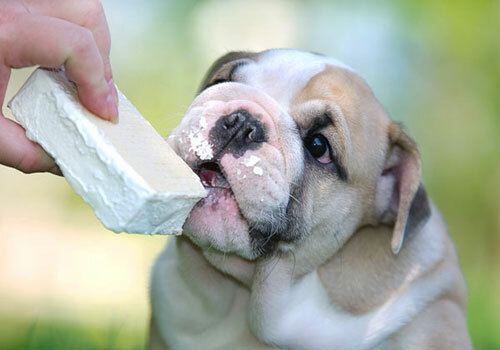 Cheese should be safe for all puppies over 6 months old – again, when given carefully and in moderation. Make sure they’re okay to digest it before giving it to them otherwise it can lead to stomach problems. Puppies under six months of age should only ever stick to their vet recommended puppy food, as other foods can cause digestion problems. So, what have we learned? 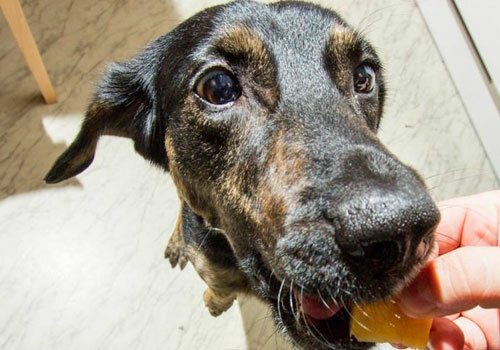 Can dogs eat cheese without a worry? The answer is generally YES. Cheese can have a lot of nutritional benefits for your pooch when given in moderation and prepared correctly. If in doubt, go for cottage – it’s low in sodium and fat, which makes it the perfect addition to your dog’s diet. Always keep your eye out for any symptoms of lactose intolerance. If your dog turns out to be allergic to cheese, you can always try out dairy-free cheese alternatives instead – most of them are actually reasonably delicious and very similar in feel and texture to cheese. Consult your vegan friends! Finally, always make sure that cheese is a valued treat rather than a daily occurrence. Too much cheese built up in your dog’s body can lead to gaining weight and unpleasant stomach problems. Follow these simple guidelines and you’re certain to have one happy, satisfied, cheese-loving pooch in your life!